When it comes to buying a good stand mixer, there are many things to consider. 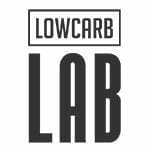 Depending on your intended use, you might be looking for power if you bake several dense loaves of bread per week. But, if you only use a mixer for small jobs, a large capacity mixer might not be able to carry out simpler tasks efficiently. One thing is for sure; we are all looking for the best machine money can buy for our particular mixing needs. Below we reveal the best stand mixers of 2018 based on power, speed, attachments, durability, warranty, and value. 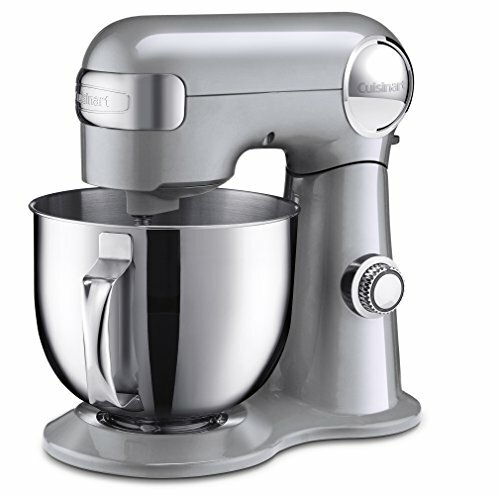 The KitchenAid Artisan mixer is repeatedly one of the best kitchen mixers on the market. Known for its ease of use and durability, this mixer can be purchased in 20 radiant colors and comes with a 5-quart stainless steel bowl, a dough hook, a six-wire whip, a flat beater and a pouring shield. The only thing missing is a rubber spatula mixer attachment which is sold separately, but can easily be found at retail stores like Marshalls and TJ Maxx. The bowl fits tightly in its place, the motor is quiet, the attachments are easy to use and clean, and the tilt lever lock is secure. The only way to improve the Artisan would be to include a safety lock for when the mixer is tilted into the up position so it doesn’t come crashing down when you least expect it. 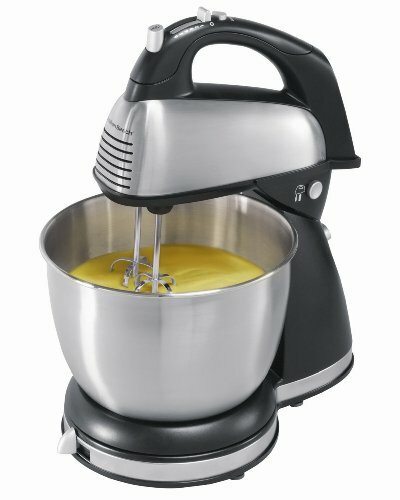 With a 325-watt motor (check out the power conversion calculator) and ten speeds that let you go from a quick whip to a slow stir in a blink, this mixer is powerful and sturdy and won’t move around on your counter, or lose speed, when working with sticky, dense ingredients like honey and dough. 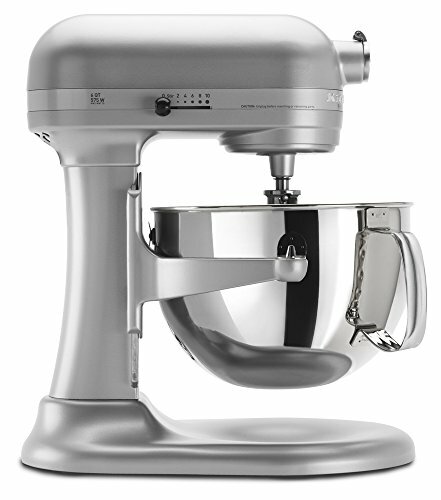 For a lighter duty stand mixer, the 22-pound KitchenAid Ultra Power 4.5 Quart Mixer has a 300-watt motor and is a bit smaller than the Artisan. It’s one of the best KitchenAid mixers for mixing lighter bread doughs and has ten levels of control so you can quickly beat egg whites or slowly blend in butter. It’s a wonderful mixer for cake mixes, frostings, meringues and cookies and comes with a beater, a hook, a whip and a 4.5-quart stainless steel bowl. As always, there are a few drawbacks. Unless mixing light ingredients, the bowl may not remain attached to the stand and blending heavy dough mixtures can cause the mixer to smoke and break down. Due to its smaller bowl, liquids and flours may splash out while being added, even at low speeds, and the burnished metal coated beaters are not dishwasher safe. The mixer does, however, accommodate 5- quart bowls to reduce the amount of splashing. 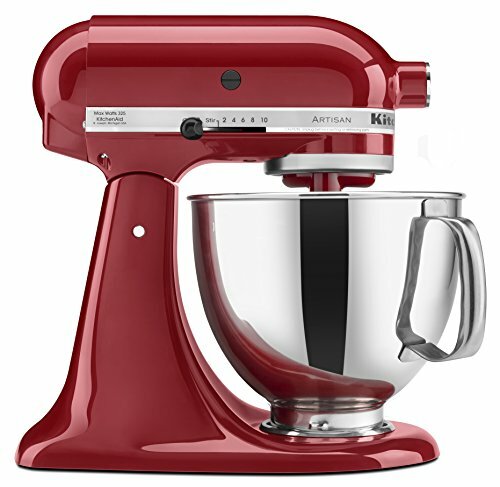 Weighing in at 28 pounds, the Professional 600 series 6-Quart KitchenAid stand mixer is a great machine for really dense concoctions and is without a doubt the best stand mixer for making dough. It comes with a 6-quart stainless steel bowl, a spiral dough hook, a six-wire whisk and a burnished flat beater and with a 575-watt motor, it is much more powerful than the Artisan. Although the heavy-duty jobs like kneading may be a piece of cake for the Pro, the more delicate jobs like whipping eggs whites aren’t accomplished with such ease. In addition, the hook doesn’t clean the walls of the bowl while mixing and the bowl tends to lean forward and not sit firmly in its place. The bowl also takes an incredible amount of strength to attach and the attachments are equally difficult to remove. Also, the handle to lift the bowl and the speed holds are not on the same side of the machine which makes it difficult to position it against a wall. From kneading dough to blending dressing, the Hamilton 6-Speed Classic Stand Mixer helps you to achieve whatever mixing results you desire. 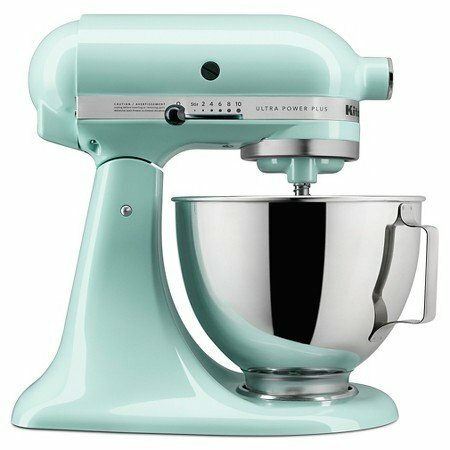 At only 4.98 pounds, this 290-watt mixer comes with two beaters, a whisk, two dough hooks and a 4-quart stainless steel bowl. If you’re debating on whether to buy a stand mixer vs a hand mixer, your problem is solved because this stand mixer doubles as a hand mixer to give you incredible versatility. However, in thick cookie batter, the wands of this mixer can suddenly stop moving. Also, the beaters don’t reach all the way to the bottom of the bowl when on the stand, so mixing can be uneven. When kneading thick dough the mixer may start to smoke and shut down without warning. When mixing dry ingredients, the lowest speed may be too fast resulting in ingredients flying out of the bowl. The lowest speed is also too fast for slow creaming. Finally, this machine has a history of shutting down and not working between 5 and 20 uses. 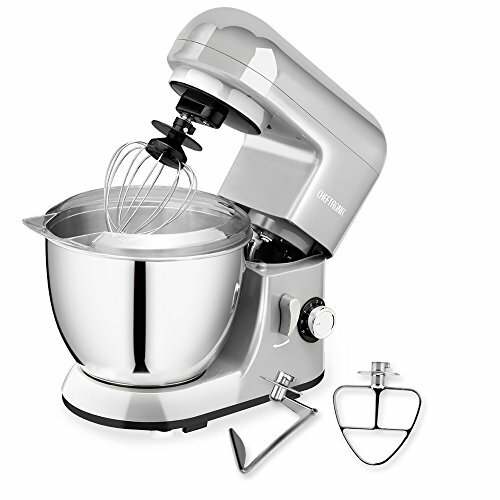 Constructed from die-cast metal, The Cuisinart SM-50BC Stand Mixer comes equipped with a 5.5-quart stainless steel bowl, a chef’s whisk, a flat mixing paddle, a dough hook and a splash guard with a convenient pour spout. Despite weighing only 18 pounds, the mixer and bowl are sturdy and solid and can mix through the thickest bread recipes like butter. It also has a 500-watt motor with 12 speeds for precise mixing and can mix up to five batches of cookies and up to six cups of flour at one time. The pour spout on the splash guard is a nice touch but needs to be deeper as ingredients can spill despite careful pouring. The bowl can also spontaneously come loose from the base while mixing. The attachments do not extend all the way to the bottom and the motor is quite loud. The Cuisinart SM-70 BC is a 12-speed, 7-quart, 1000 watt powerhouse that includes a 15-minute countdown timer, a slow-start option, a gentle-fold function and an automatic shut off sensor. 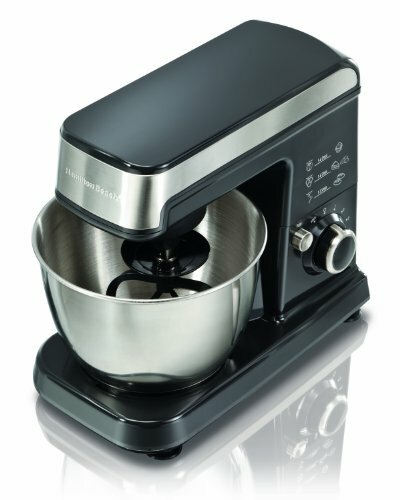 Ideal for small or large quantities of batter or dough, this mixer has the capacity to take on any job your recipe needs. Even though the 7-quart bowl is taller than the 5.5-quart bowl, it is not wider which makes scraping the bowl all the way to the bottom very difficult. The wires from the chefs whisk tend to break regularly and/or fall out of their holes. The paddle does not always pull the ingredients up from the bottom leaving dry ingredients behind. 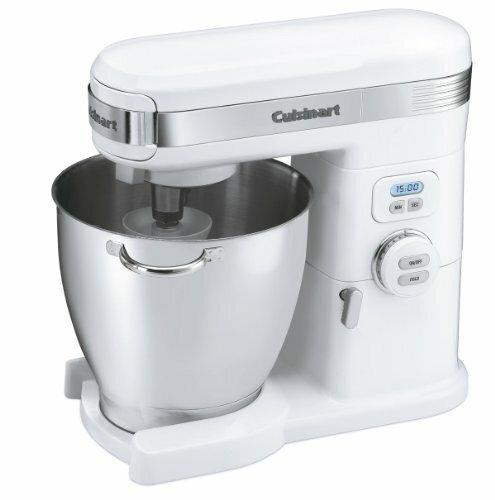 And, although it claims to be a heavy-duty machine, this Cuisinart mixer can overheat and shut off when mixing in excess of 10 cups of flour. When plugged in and working this mixer consumes a great deal of electricity which can sometimes overload circuits. Finally, replacement parts are hard to locate and authorized repair facilities are few and far between. The Breville BEM 800XL Scraper Mixer Pro 5-Quart is both an elegant and functional piece of machinery and with a flat beater attachment that scrapes down the sides of the bowl as it mixes, this machine is a bakers dream. 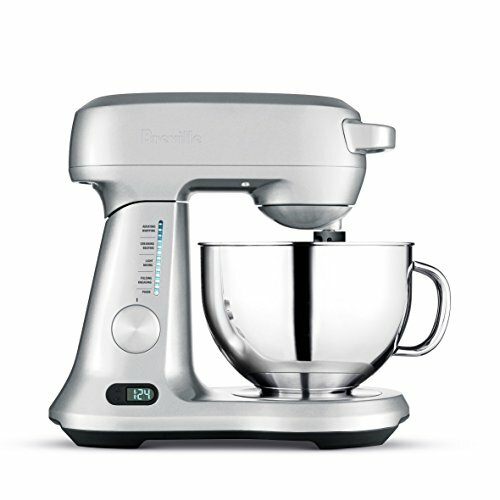 This Breville stand mixer comes with a 5-quart stainless steel bowl, a dough hook, a wire whip, a two-piece pour shield, a flat beater and a unique flexible scraper beater that will cut your mixing time in half. With a 550-watt motor, it’s not as quiet as other models, but it is five pounds lighter than the Artisan and has a cord capture to keep the cord out of your way. The faults are few but significant. When mixing at top speed, this mixer tends to walk around, and when removing the paddle attachment, there isn´t enough room to grab it without soiling your hands. It also has an automatic shut off feature that may or may not go off if your mixer is too full. All-in-all, this mixer is great for the occasional baker, but for demanding jobs, it’s best to go with a sturdier option. Another light-duty option is the Hamilton Beach 6-Speed Stand Mixer that is great for whipping creams, batters and cookie dough. It comes with a 3.5 stainless steel bowl, a dough hook, a whisk, a flat beater and a splash guard and all are dishwasher safe. It even has non-slip feet to help keep the mixer in place. Like many high-priced mixers, it has the popular planetary mixing action and with a gentle fold speed setting, this mixer is great for every mixing need. Even though the manual says all parts are dishwasher safe, the hook comes out of the wash with a black metal residue. The mixing head is very wide and ingredients can only be added after stopping the machine and lifting the head. The same can be said for scraping down the sides of the bowl as this can only be done by stopping the machine and lifting the head. With thicker bread and pizza doughs, the mixer can stall unless the dough is a single serving and/or incredibly wet. The 5.32-pound Cheftronic SM-985 Stand Mixer is a great value and a wonderful starter mixer. Accessories include a dough hook, a flat beater, and a wire whip as well as a 4.2-quart stainless steel bowl. Rubber suction cups keep the machine in place while mixing and the splatter guard fits securely and seals well. This mixer also has a 350-watt motor with six optimized speeds and a pulse button to allow for a variety of functions including whipping creams, mashing potatoes or mixing cookie dough. The flat beater and dough hook are made from aluminum alloy but, they are not dishwasher safe as the heat will corrode the coating of the utensils. Replacement parts are hard to find and the machine must be turned off to scrape down the sides of the bowl. Attachments don’t reach the bottom or sides of the bowl and ingredients must inevitably be mixed by hand. With a 5-quart glass bowl, a bright LED light, a 360° Splash Guard, and a 500-watt motor the 10-speed Kenmore Elite Ovation is a gamechanger. Its patented Pour-In Top Design and slow-start mixing option allows you to add dry or wet ingredients without stopping and without the mess. 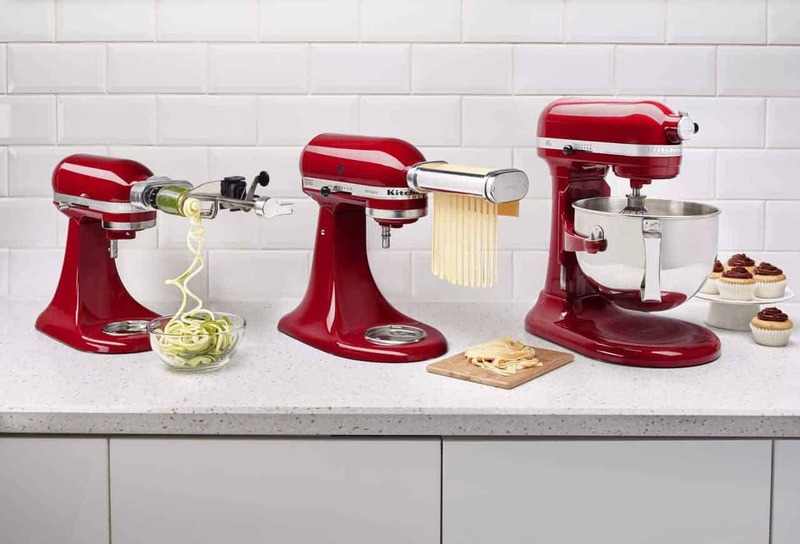 Accessories include a flat beater, a wire whisk, a dough hook, an egg separator, and a grater as well as a 15-recipe cookbook. From gently folding in egg whites to kneading the densest dough, the Ovation lets you do it all with ease. As sleek and elegant as a glass bowl may be, it can be too heavy for some people to lift when full and a stainless steel option would be better. Replacement tools and accessories are also hard to come by. The splash guard is secured into place with small pieces of rubber that are slippery when wet and may fall off with time. A twist lock feature for the splash guard would be preferred. Investing in a stand mixer is a difficult decision and hopefully, this article has given you some insight. After hours of kneading bread dough, whipping creams, mixing cookie dough and measuring splatter, we found that most of these mixers do an amazing job. 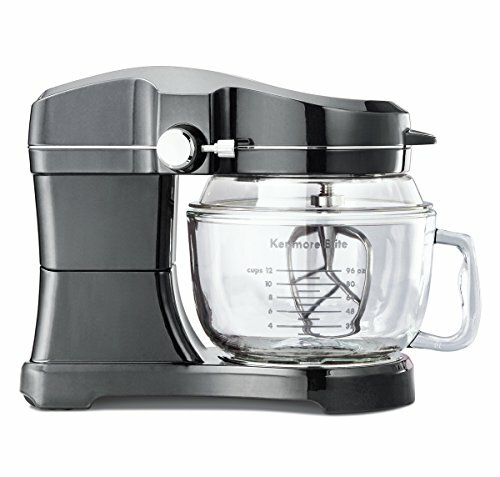 Some perform faster while others are more efficient, but the clear choice between the KitchenAid mixer vs Cuisinart mixer or Hamilton Beach vs KitchenAid is hard to define. Rest assured, no matter which mixer you end up choosing, you can be confident you’ll be purchasing a high-quality, durable and reliable machine that can be used for heavy-duty jobs as well as those requiring a little more finesse.